Undoubtedly the most complicated virtual instrument I have ever been a part of creating, Electri6ity is a virtual electric guitar sample library that includes eight of the most famous guitars in history (Stratocaster, Telecaster, Les Paul, etc. ), 24,000 raw samples, three pickups, multiple amps, numerous articulations, a chord library. It took more than three years to complete this project, but once you see it in action, you may understand why. While the guitars were extremely time-consuming to record in such detail, an equal or greater amount of work went into the design and scripting (done by the genius script writer Benjamin Stelzer), programming Kontakt to control the samples in the most intuitive way possible. It’s been a hit; after its introduction at the NAMM show, people have been raving about it. Many more videos, which are extremely worthwhile viewing, can be found on the Vir2 YouTube channel. After more than three years of development, Vir2 Instruments presents Electri6ity, an epic electric guitar virtual instrument containing the most advanced, detailed, and versatile collection of electric guitars ever made in a virtual instrument. 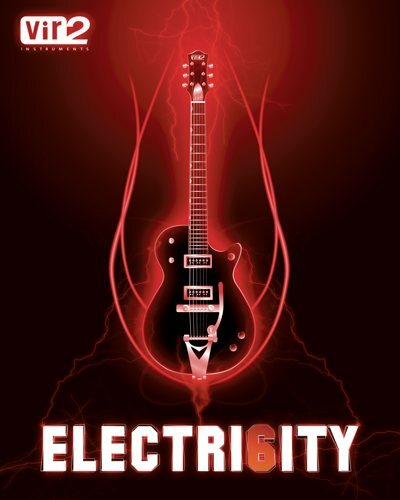 Electri6ity contains eight of the most famous and distinguished guitar tones from the history of the instrument. More than 24,000 24-bit samples were taken of each guitar. Three pickup options (front, rear, and mixed) are available on every guitar. An impressive amount of samples allow you to play every articulation on every fret of every string for an absolutely authentic guitar sound. Downstrokes, upstrokes, seamless velocity layers, ghost notes, mutes, harmonics, hammer-ons, pulloffs, slides, releases, and FX…the sky is the limit with Electri6ity. Electri6ity also utilizes the most advanced scripting to date, including the revolutionary Articulation Morphing Technology (A.M.T.) and Velocity Morphing Technology (V.M.T. ), allowing for the seamless morphing from dead mute to sustain or from soft to loud. Advanced string and fretboard positioning is performed by artificial intelligence which adapts to your playing. 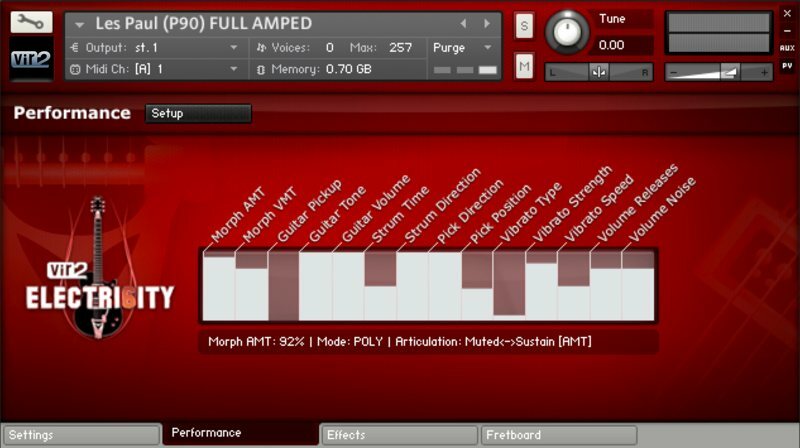 Play fluid lines in real time using the legato engine, play chords using the chord detection engine which understands almost two thousand different chords, easily double-track, do unison bends, strum, pick, trill, tremolo pick, slide…all of this is built into the Electri6ity engine and full editing control is given over each of these parameters. 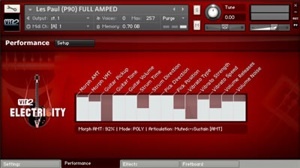 All samples in Electri6ity are recorded clean – a direct input from the guitar. Use Electri6ity’s built-in multieffects (phaser, flanger, chorus, reverb, and delay), Screamer module, and amp simulation (British, Classic, Clean, Jazz, Metal, Modern, and Rock) to make the sound come alive, or use your own guitar amps or simulators to multiply the possibilities.